Rebecca Sheppard joined Frost & Associates, LLC, as an attorney in June, 2016. Rebecca previously worked for the Comptroller of Maryland in the Hearings and Appeals Section. Rebecca conducted administrative hearings, issued binding legal determinations and negotiated settlement agreements on behalf of the Comptroller of Maryland. Rebecca gained hands-on experience in multiple practice areas, including: Individual Income Tax, Corporate Income Tax, Sales and Use Tax, Withholding Tax, Admissions and Amusement Tax, Motor Fuel Tax and Business License Revocation. Rebecca is also experienced in Personal Officer Liability stemming from assessments in Sales and Use Tax, Withholding Tax and Admissions and Amusement Tax. Rebecca received recognition from the Comptroller of Maryland for outstanding customer support and served as a member of the Maryland Charity Campaign. Prior to joining the Hearings and Appeals Section, Rebecca was a Law Clerk for the Maryland Tax Court. Rebecca also practiced law as an associate for a small firm in Baltimore County where she drafted Trust and Estate documents, performed Estate Administration and prepared Medical Assistance applications and appeals. 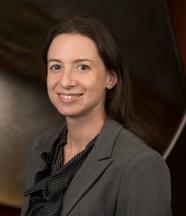 Rebecca graduated from the University Of Baltimore School Of Law, earning her Juris Doctor in the Spring of 2011. Rebecca attended college at the University of Maryland, College Park, and graduated with a degree in Government and Politics in the Spring of 2006.